Riverside International Raceway (sometimes known as Riverside, RIR, or Riverside Raceway) was a motorsports race track and road course in the Moreno Valley area, a suburb just east of Riverside, California. Riverside was a hot, dusty place. It was at times, also a dangerous place, yet it is remembered with affection by drivers and fans alike, as the home of road racing in southern California. It was also considered one of USA's finest tracks. The track was in operation from September 22, 1957, to July 2, 1989, with the last race, The Budweiser 400, won by Rusty Wallace, held in 1988. After that final race, a shortened version of the circuit was kept open for car clubs and special events until 1989. In the beginning it was originally called The Riverside International Motor Raceway. It was built in early 1957 by a company called West Coast Automotive Testing Corp.. The head of West Coast Auto Testing was a man by the name of Rudy Cleye, from Los Angeles, who had previously raced in Europe. However the building of the raceway met with funding difficulties early on and a businessman by the name of John Edgar provided a much needed cash bailout. This action prevented any halt in the track's construction. The first weekend of scheduled races in September 1957, a California Sports Car Club event, John Lawrence of Pasadena, California, lost his life. Lawrence, a former Cal Club member, piloting a 1500 cc Production champion, went off at Turn 5 (later designated Turn 8). With no crash barrier in place, and no rollbar on the car, Lawrence's MGA went up the sand embankment, then rolled back onto the track. Though Lawrence survived the incident, and appeared only slightly injured, he died later at the hospital of a brain injury. The second major event at the track, in November 1957, was a sports car race featuring some of the top drivers of the day, including Carroll Shelby, Masten Gregory and Ken Miles. Another driver entered was an inexperienced local youngster named Dan Gurney, who had been offered the opportunity to drive a powerful but ill-handling 4.9-liter Ferrari after better-known drivers such as Shelby and Miles had rejected it. Shelby led early but spun and fell back. Gurney assumed the lead and led for much of the event. Shelby, driving furiously to catch up, finally overtook Gurney late in the race and won. Gurney's performance caught the eye of North American Ferrari importer Luigi Chinetti, who arranged for Gurney to drive a factory-supported Ferrari at Le Mans in 1958, effectively launching the Californian's European career. Footage exists of classic races like the 1986 Los Angeles Times Grand Prix in which the Chevy Corvette of Doc Bundy, attempting a three-wide pass, hit the Ford Probe of Lyn St. James and the Jaguar of Chip Robinson at Turn 1. St. James' car caught fire and Chip Robinson nearly cartwheeled into the crowd. St. James survived the flames and Robinson escaped uninjured within the track bounds. The track was known as a relatively dangerous course, with its long, downhill back straightaway and brake-destroying, relatively slow 180-degree Turn 9 at the end. During the 1965 Motor Trend 500 NASCAR race, Indycar great A. J. Foyt suffered a brake failure at the end of the straight, shot off the road and went end-over-end through the infield at high speed. Crash crews assumed Foyt was dead at the scene, until fellow driver Parnelli Jones noticed a twitch of movement. Ford factory sports car driver Ken Miles was killed there in a testing accident in August 1966 when his Ford sports car prototype (known as the J-car) became aerodynamically unstable and flew out of control at the end of the back straight. In December 1968, American Formula 5000 champion Dr. Lou Sell crashed and overturned in Turn 9 on the first lap of the Rex Mays 300 Indianapolis-style race, suffering near-fatal burns. In January 1967, Canadian driver Billy Foster crashed at Turn 9 during a practice-session just prior to the start of qualifying for the Motor Trend 500 NASCAR race. These accidents and others caused track management to reconfigure Turn 9, giving the turn a dogleg approach and a much wider radius (a water improvement also closed the raceway for a few months). In January 1964, Riverside also claimed the life of 1962–'63 NASCAR champion Joe Weatherly, who refused to wear a shoulder harness and wore his lap belt loosely. Weatherly died when he lost control entering Turn 6, hitting the steel barrier almost broadside and had his head snapped out the window against the barrier. Nevertheless, in 1983 Turn 9 was the site of the only fatality in IMSA GTP history. In the 1983 Times Grand Prix, Rolf Stommelen's Joest-constructed Porsche 935 lost its rear wing at the Dogleg and hit two freeway-type barriers sending it into a horrific roll at Turn 9. Of the entire road course races run at RIR, there was one that was run in a counter-clockwise direction, sometime around 1960. In 1966 Dan Gurney tested his first Eagle racing car on a shorter, counter-clockwise version of the track tailored specifically for his car's Indianapolis-specific left-turn oiling system. The test caused Gurney to ask track president Les Richter to hold an Indianapolis-style race there. From 1967 to 1969 the Rex Mays 300 served as the season-ending USAC Indianapolis-car race. ESPN taped the June 12, 1988, Budweiser 400 race at RIR and caught racer Ruben Garcia crashing hard off turn 9 and his car went through two cement barriers before coming to rest near a catch fence where fans were sitting. He was not injured, though, and neither were the race fans. After 14 years of NASCAR as a driver and later a car owner, Richard Childress won his first NASCAR race in 1983, when Ricky Rudd drove his #3 Piedmont Airlines Chevrolet to victory in the 1983 Budweiser 400k. From 1981 until 1987, NASCAR's championship race was at Riverside. The USAC Championship Trail also held their season ending race from 1967 to 1969. Riverside was home to track announcer Sandy Reed and (along with former LA Rams player Les Richter) Roy Hord Jr.
NASCAR Team owners Roger Penske and Rick Hendrick drove a select few races at Riverside in their own cars. Penske won a Winston West race in 1963, while In the final race in 1988, Hendrick got out of the car and let Elliott Forbes-Robinson take over. The Winston Western 500 came to be known as the signature event at the track. Initially (1963-1981) this race was held in January as the Winston Cup Series season opener, but beginning in 1982 NASCAR elected to start the season with the Daytona 500. From 1981-1987 the Winston Western 500 was held in November as the final race of the season. Riverside also hosted drag racing events. Between 1961 and 1969, the Hot Rod Magazine Championship Drag Races, "one of the most significant drag racing events" of that era, were held at RIR. The championship offered a US$37,000 prize, greater even than a National Hot Rod Association national event prize at the time. The track was built to accommodate several different configurations, depending on the type of car and race length. The three options on Riverside Raceway were the long course (3.27 miles (5.26 km)), the short course (2.5 miles (4.0 km)), and the NASCAR (2.62 miles (4.22 km)) course. The original racetrack had a 1.1-mile (1.8 km) backstretch from 1957 to 1968. When the track was redesigned in 1969, Turn 9 was reconfigured with a wider radius and banked with a dogleg approach added, to reduce strain on the cars' brakes. The fourth track configuration was a drag racing strip. Before a racing event at RIR, track crews added traffic pylons to close off sections of the track. The closed sections were determined by the specific course and cars used during any given race. Throughout its history, various other track configurations were used to adapt the track for events such as off-road and motorcycle events. Diagram notes: The long course had the 1.1-mile (1.8 km) backstretch between turns 8 & 9. This version was used primarily for the Los Angeles Times Grand Prix, although the long course was also used for Indy car racing in the mid-1980s. When the 1969 version was built, the dogleg was added so as to ease the transition into Turn 9 (the track had seen numerous brake failure-induced accidents approaching Turn 9, and this change was made as a safety measure). In the short course, the track would use turn 7A rather than 8. The "Turn 7-7A" configuration effectively shortened the back straight to just over one-half mile in length. The NHRA drag strip ran south to north on the backstretch from the runoff to the Bosch Bridge (not shown in diagram), which crossed over the track about halfway between turns 8 & 9. Riverside International Raceway with & without dogleg. The drag strip is in light blue and ran north to the Bosch bridge (bridge not shown). Due to its proximity to the Southern California entertainment industry, RIR was a frequent filming location for Hollywood movies, television series and commercials. Scenes from the television shows CHiPs, Simon and Simon, The Rockford Files, Knight Rider, and the HBO program Super Dave Osborne were shot on location at RIR. The television movie adaptation of Gemini Man, Riding With Death, featured as an experiment on the television show Mystery Science Theater 3000, also contains footage of racing at Riverside. RIR was extensively featured in the 1961 telefilm "The Quick and the Dead," an episode of the series Route 66. The episode stars Martin Milner and George Maharis, and guest stars Harvey Korman, Regis Toomey, and Betsy Jones-Moreland. Milner races a 1960 powder-blue Chevrolet Corvette in the film. Film shoots at RIR included scenes from: Good Guys Wear Black (1978) The Betsy (1978), Fireball 500 (1966), Grand Prix (1966), The Killers (1964), The Love Bug (1968), On the Beach (1959), Roadracers (1959), Speedway (1968), Stacey (1973), Thunder Alley (1967), Winning (1969), and Viva Las Vegas (1964). The track was used in Sierra Entertainment's NASCAR Legends, NASCAR Heat and later was converted to NASCAR 4, NASCAR Racing 2002 Season, 2003 and rFactor. Riverside has also been featured in Indianapolis 500: Evolution for the Xbox 360. RIR, headed by former Los Angeles Rams player Les Richter sold the property to real estate developer Fritz Duda in 1983. The irony is that Duda had once been a turn announcer for NASCAR's broadcasting arm Motor Racing Network, and many felt racing would long be a part of the Riverside landscape. 1988 was the final year of racing for Riverside International Raceway. On June 12, 1988, NASCAR held its final race at RIR – a race won by Rusty Wallace (a caution flag was out for Ruben Garcia when he came off Turn 9 and lost control of his car and hit a wall, missing the grandstands). In 1989, the track was modified from turn 7A to the back straight. The modified track was called Riverside Regional Raceway and continued to be used for club events. After SCORE International held its last race, the track finally closed its gates after 32 years of racing. Fritz Duda turned the "House that Dan Gurney built" into a shopping mall which opened in 1992. The Moreno Valley Mall at Towngate is on the northern end of the former raceway property and homes now occupy the southern end of what was the old racetrack (where Tim Richmond and Dale Earnhardt raced). In a 1994 topographical map, the remains of Riverside's Turn 9 and a wall were still visible. However, today nothing is left of RIR except for memorabilia from the racetrack. The old Administration Building remained until 2005, when it was torn down to make way for a complex of town homes. Numerous streets in the neighborhood to the east of the Moreno Mall are named after racing identities, such as Yarborough Drive, Gurney Place, Donohue Court, Surtees Court, Brabham Street, Andretti Street and Penske Street. When Riverside closed in 1989, it followed in the footsteps of Ontario Motor Speedway (in nearby Ontario), which closed in 1980, and followed by Ascot Park in Gardena in 1991. In the 1990s, two new circuits opened: Auto Club Speedway in nearby Fontana in 1997, and Toyota Speedway at Irwindale (now the Irwindale Event Center) in 1999 and is in danger of meeting the same fate as Riverside. Both tracks, like Riverside, have been used for filming. 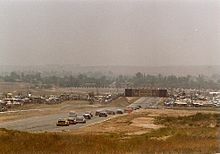 In 2003, the remainder of the old Riverside International Raceway was torn up. The sign that was at California 60 and Day Street was removed to make way for a Lowe's warehouse and Turn 9 of the old track is now home to houses. In 2003, plans were announced to build a 3-mile (4.8 km) road course with a similar design to the famed Riverside layout in Merced, California. The track would have been known as the Riverside Motorsports Park, but the project was abandoned in 2009. NASCAR in the esses at RIR 1983. The first IROC race was held in Oct. of 1973. NHRA drag racing in the mid sixties. SCORE International Off Road World Championships, the last one was held in August 1988. ^ Parker, C. "One of America's finest tracks". racingcircuirs.com. Retrieved 18 November 2018. ^ "Budweiser 400 88". racingreference.com. Retrieved 17 November 2018. ^ "Racing Reference". racingreference.com. Retrieved 17 November 2018. ^ a b Hansen, B. "After the last race". racingcircuitsinfo.com. ^ Glick, Shav (Aug 7, 1988). "RIR History". L.A.Times. Retrieved 17 November 2018. ^ Stahler, Tom. "First death at RIR". drivingline.com. Retrieved 18 November 2018. ^ Cider, Frank. "Riverside International". oscarbyalpinestars.com. ^ Sider, Frank (17 December 2009). "OSCAR by Alpinestars: Riverside International Raceway". ^ "Riverside International Raceway (Riverside, California)". GTPlanet. ^ Miller, Joe. "MNRL Season 1, Race 6 information- Riverside Int. (Jan 10th)". cmsracing.com. Retrieved 24 November 2018. ^ Taylor, Thom. Untitled item in Hot Rod Magazine, February 2017, p. 11. ^ Kettle, Tom. "RIR configurations". racingcircuits.info. Retrieved 18 November 2018. ^ Bechtel, Harry. "IROC @ Riverside". latimes.com. Retrieved 17 November 2018. Motorsport Memorial entry on Rolf Stommelen (2005), motorsportmemorial.org. Retrieved February 1, 2005. Wikimedia Commons has media related to Riverside International Raceway.